Our March monthly meeting is a special town hall featuring a panel discussion and extensive Q&A on the importance of making the Mueller Report public. Special Counsel Robert Mueller has completed his investigation into questions of Russian interference in the 2016 election, and although most people think the final report should be made public, that’s not guaranteed. 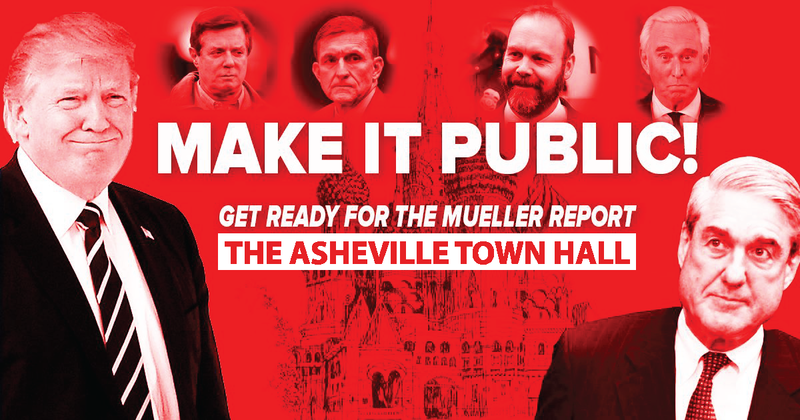 We will share information about the Mueller investigation and how you can help in our call to action to demand that Senators Thom Tillis and Richard Burr push to make the final Mueller Report public. Earlier on Wednesday we will be delivering signed petitions to Sen. Thom Tillis’s office in Hendersonville, urging him to stand up for making the report public. Please sign and share the online petition here. The MAKE IT PUBLIC! TOWN HALL is produced in partnership with the nonprofit Progress North Carolina. Our co-hosts are Indivisible Black Mountain, Madison County Indivisible, and Stronger Together WNC-North. The town hall is free and open to the public. First Congregational Church is located at 20 Oak Street in downtown Asheville, across from the First Baptist Church. Doors open at 5:30, and the meeting will start promptly at 6:00. NOTE: Indivisible AVL General Meetings are normally held on the last Tuesday of the month, but for scheduling purposes with Progress NC, this month’s meeting will be held on Wednesday. There will not be an additional meeting this month.